Three females of European bison, coming from Eriksberg Wildlife Park in Sweden, were today brought to the Eastern Carpathians rewilding area, to augment the existing population of some 270 animals with new genes. This is the first joint activity after signing the Memorandum of Understanding between the European Bison Conservation Center and Rewilding Europe on 15 September this year. European bison in the Bieszczady Mountains. The animals are taken to an acclimatization enclosure in the forest district of Wola Michowa at Bieszczady Mountains, and are expected to be released into the wild within a month’s time, after the quarantine period. So, by the end of the year they will join the already existing population of European bison in this area, and we hope they will strengthen its genetic pool and thereby reduce the degree of inbreeding, making the herd more stable genetically and long term viable. 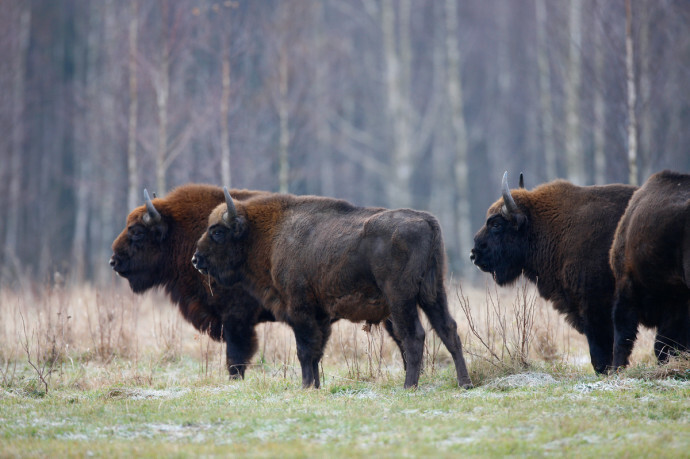 The MoU between the European Bison Conservation Center (EBCC) and Rewilding Europe has the aim to work together on the conservation and comeback of the iconic European bison. The arrival of the bison to the Eastern Carpathians rewilding area. – “European Bison Conservation Center will still work hard to create, restore, enhance or maintain healthy free-ranging European bison populations across the former distribution range of this species, on a scientifically sound basis. EBCC have agreed to work together with Rewilding Europe believing that it could be helpful in achieving this goal”, says Professor Wanda Olech, Coordinator and President of EBCC, and the Chairman of European Bison Friends Society. – “Both organisations have pooled their knowledge and experience, working together to further strengthen a positive image of the European bison in the public mind, and to increase the number of rural communities, land owners and natural resource managers, who welcome the European bison as one of the big assets of their area”, says Frans Schepers, Managing Director of Rewilding Europe. EBCC and Rewilding Europe will work together to build new and strengthen existing populations of European bison in selected areas in Europe. The European bison conservation and rewilding efforts follow a coherent approach and build on EBCC’s well-proven scientific expertise. Also, the two organisations will further develop practical guidelines to facilitate the co-existence between people and bison and promote best practices for the conservation and management of the species, following the IUCN Bison Species Action Plan. Within the selected areas, the European bison can become a draw card for economic development, like is already shown in some areas where this species exists. In some of these areas the European bison has even already become a spearhead attraction for many – sometimes even many tens of thousands – visitors each year. The increased amount of bison-related investment, both from the public and the private sector, provides a critically important base for wildlife-oriented business to flourish, in turn providing an incentive for the conservation of the species. The European bison, the largest wild herbivore in Europe, went extinct in the wild in the early 20th century, due to habitat degradation and fragmentation, forest logging, and intensive hunting and poaching. Only 12 individuals out of 54 animals with known pedigree that remained in captivity, later formed the basis for a large-scale breeding, reintroduction and translocation program, which to date has resulted in the re-establishment of a number of wild European bison populations. The species currently exists in 33 free-living, isolated herds of two genetic lines in Central and Eastern Europe, with particular strongholds in Poland and Belarus. Currently, there are no free-living populations in Europe that are without any human influence, especially additional winter feeding and monitoring. In May 2014, Rewilding Europe in partnership with WWF-Romania brought 17 European bison to the Tarcu Mountains in Romania, with the ambition to build a large, free-living bison population in the Southern Carpathians rewilding area of at least 300 animals in 10 years time. The initiative has a very strong local leadership and support form authorities, which have planned to release this first herd into the wild, and to bring a second herd of bison to the area in spring 2015.